Pretty & Polished Summer Collection – Review and Swatches! I’m very excited to show you three of the upcoming shades from the Pretty & Polished Summer Collection. I can’t wait…so I won’t! Pretty & Polished – Wham Bam Thank Ya Sam! LOVE! 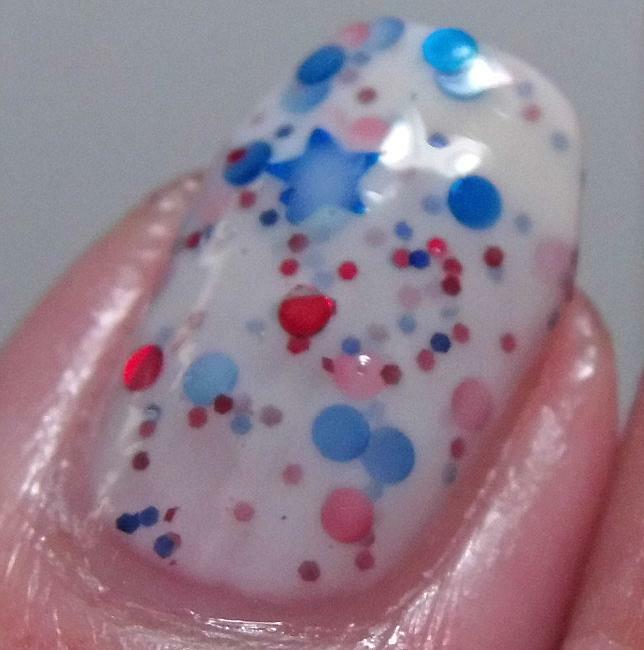 I love patriotic polishes, I love tiny star glitter, I love crelly-based glitter polishes. So all of that in one polish spells instant LOVE for me! 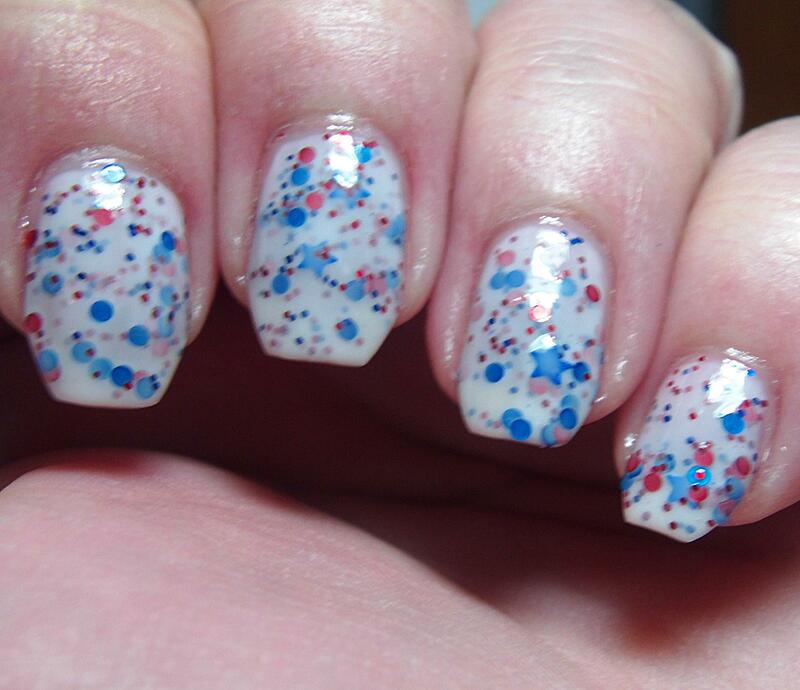 This is a squish white crelly base packed with red and blue matte and metallic glitters and especially tiny blue stars! Looooove. Honestly application on this was awesome. 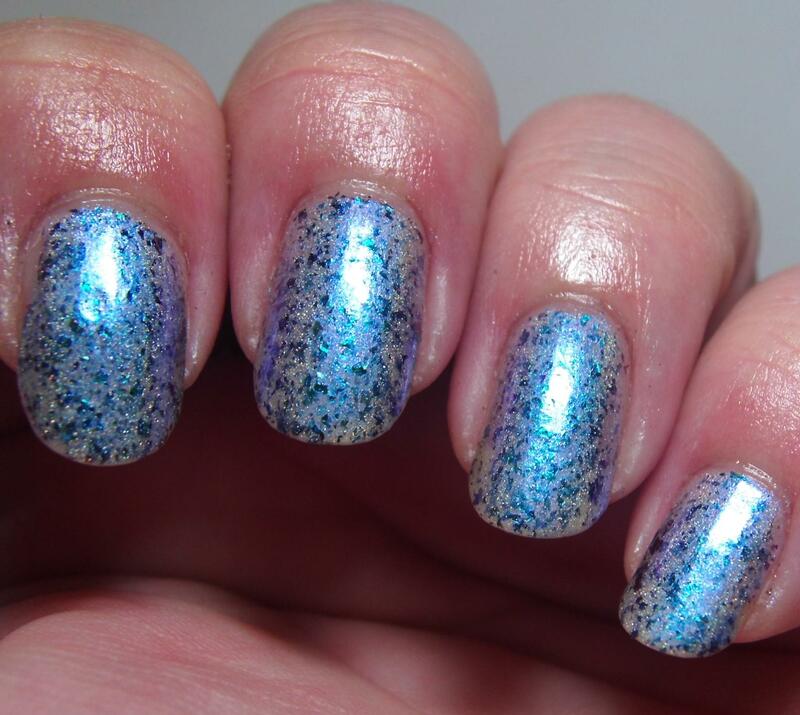 Sometimes crelly-based glitter polishes have a bit of a learning curve but I had no problems with this one, I didn’t have to fish for glitter, and I achieved opacity in two coats. I couldn’t have asked for better application of this type of polish. 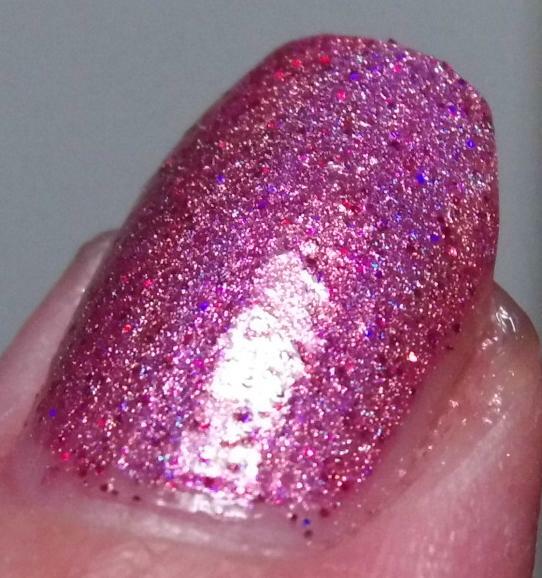 It is a bit chunky so I recommend an extra layer of topcoat to smooth out the glitter a bit this is pretty normal and what I would expect from any glitter polish. 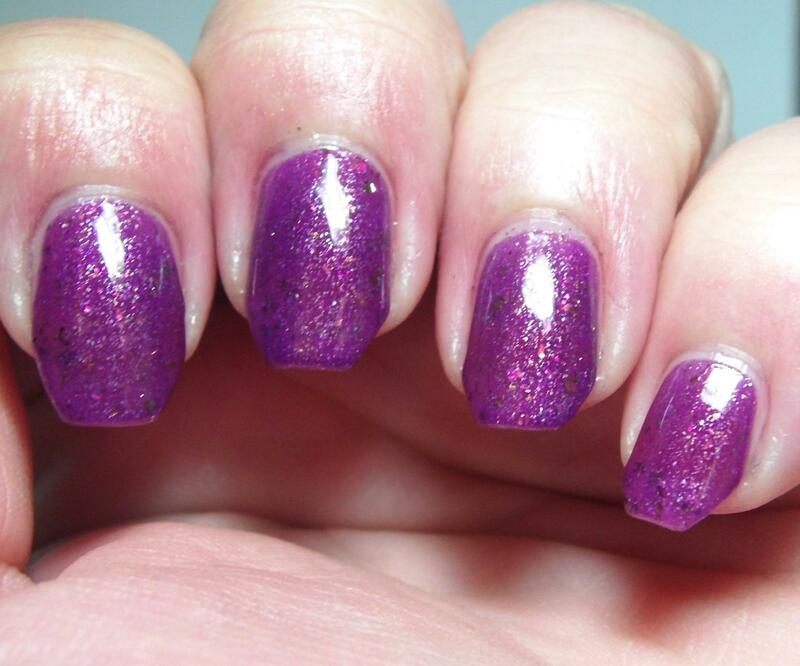 Polishes used: Barielle – Nail Rebuilding Protein; Pretty & Polished – Wham Bam Thank Ya Sam! ; Digital Nails – Ain’t Nobody Got Time for That Topcoat. 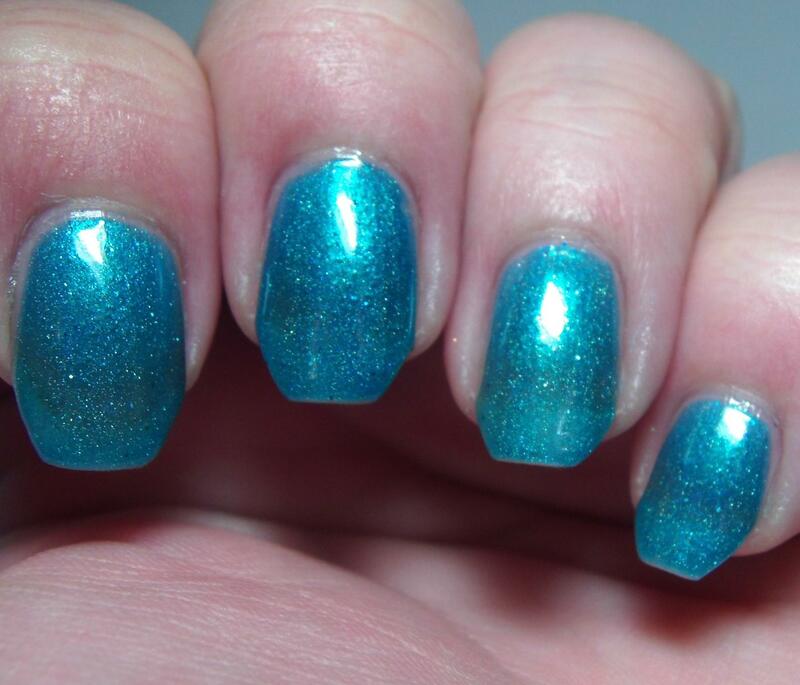 The Seaglass is Half Full is a fun polish! Some magic must have been put in the bottle though because it really looks like seaglass tossed in the sand. It brought back fond memories that I have of living in Guantanamo Bay, Cuba back in the 80’s. My friends and I would look for seaglass and one of my friend’s mother made jewelry out of the frosty smooth seaglass. 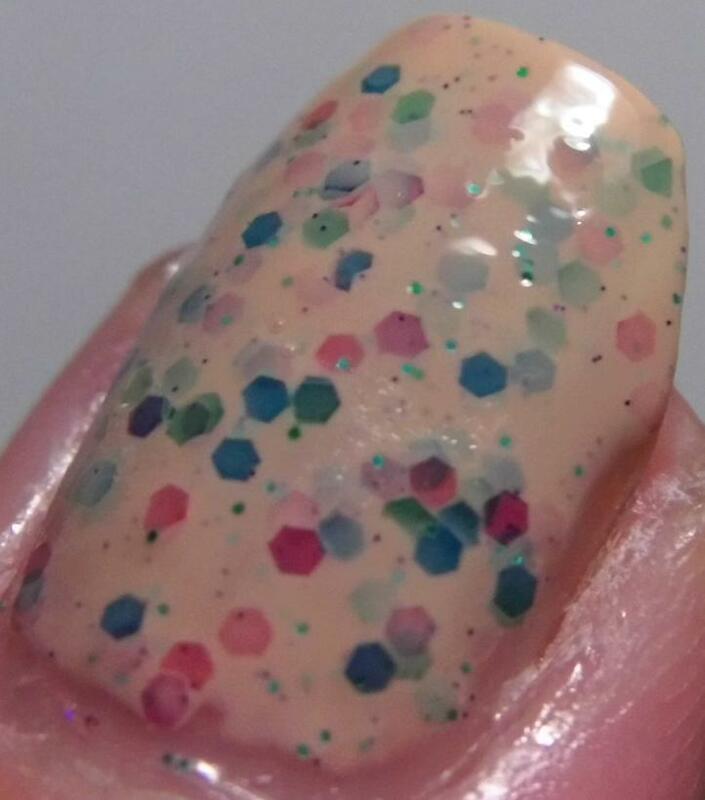 This is a sand colored crelly polish with semi-translucent matte hexes in green, pink, blue, and lavender. There is also a smattering of metallic green micro-glitter. The application was just as magic as the appearance! No glitter fishing, no glitter placement, just easy peasy swipes of the brush! Pictures show two coats plus topcoat. Polishes used: Barielle – Nail Rebuilding Protein; Pretty & Polished – The Seaglass is Half Full; Digital Nails – Ain’t Nobody Got Time for That Topcoat. 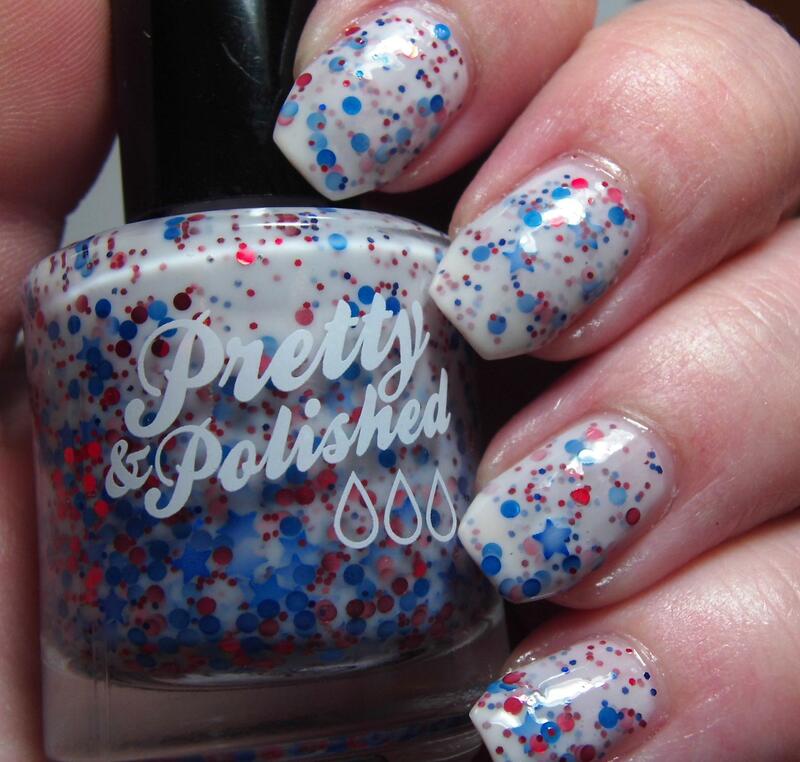 Pretty & Polished – Come On Baby Light My Firecracker! I cannot wait to wear this one again. I love this color, this polish and everything about it! 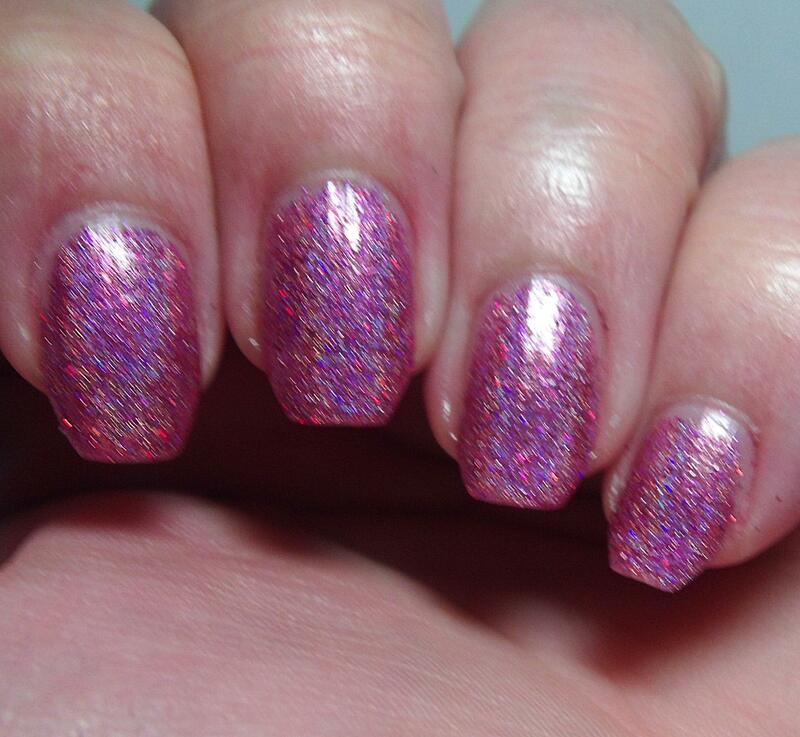 Come on Baby Light My Firecracker is a hot magenta linear holo. As if that weren’t enough it is packed with teensie tiny metallic red micro-glitter. It is a really unique combination and it’s a color that I will wear a lot! So much shimmer. Application was flawless on this polish and it sparkles in all lights because of the glitter/holo combination. I had exactly zero problems with this polish and pictures show two coats plus topcoat. Polishes Used: Barielle – Nail Rebuilding Protein; Pretty & Polished – Come On Baby Light My Firecracker; Digital Nails Ain’t Nobody Got Time for That Topcoat. There you have it – three more gorgeous shades from Pretty & Polished. I’ve been consistently impressed with polishes that I have received from them. That doesn’t surprise me though they are one of the indies that has been around for a long long time and with good reason! I also am a diehard fan of their sugar scrubs and can’t wait to try some of their mani-bombs as well! You can buy Pretty & Polished products on their Web Store. For sneak peaks, fun stuff, and contests be sure to check out their Facebook Page and Instagram Feed! Hello my dearest readers! I have a quickie swatch and review for you today. This polish had been on my wishlist for awhile and I lucked up and managed to snag one in a swap with a fellow indie polish-enthusiast. If you haven’t got this Wingdust yet, what are you waiting for?! 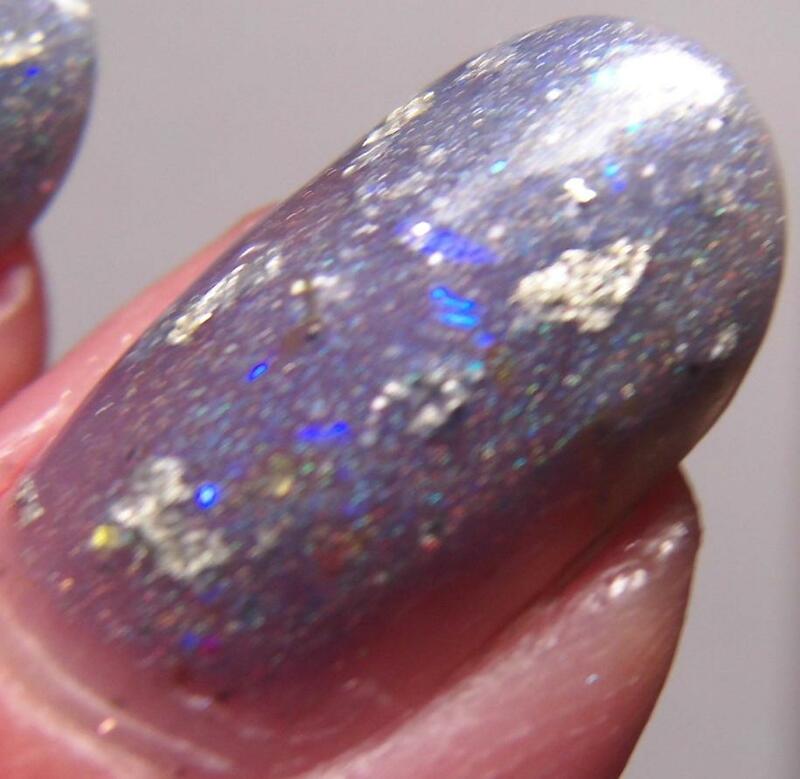 These Broken Wings is a sheer blue-gray holographic jelly polish filled with tiny silver holographic microglitter, iridescent glitter shreds, teensie iridescent bar glitter, and silver foil flakies. 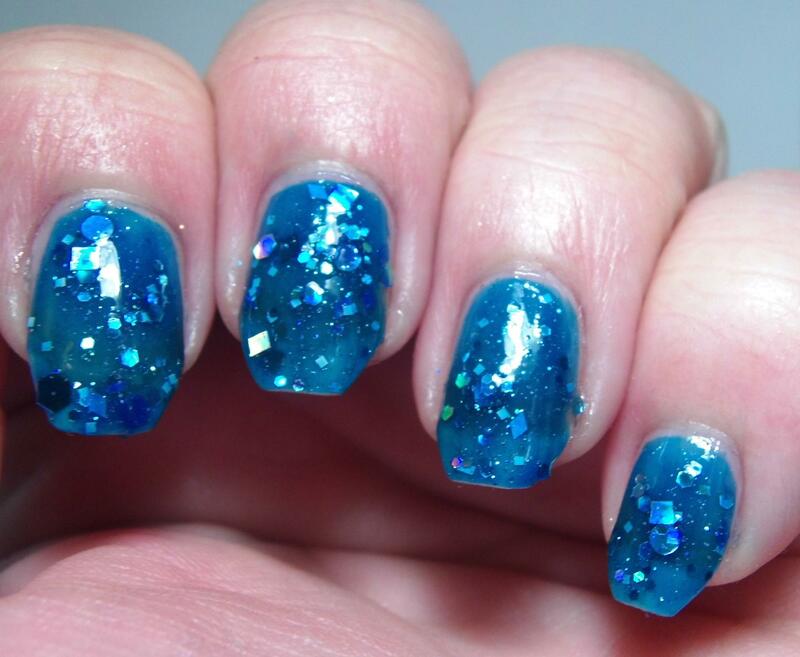 This color is right up my alley and while I did have some reservations about the foil flakes I found that I loved them! You can see a little bit of the holographic rainbow here. 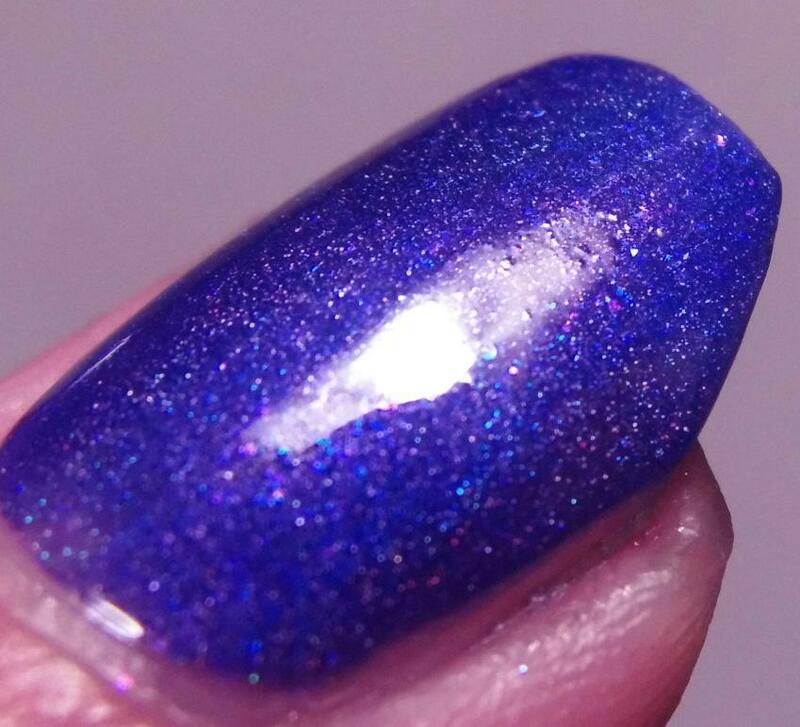 While it is a gorgeous blue-gray base because of the holographic effect and the iridescent glitters it can seem to lean just slightly periwinkle. 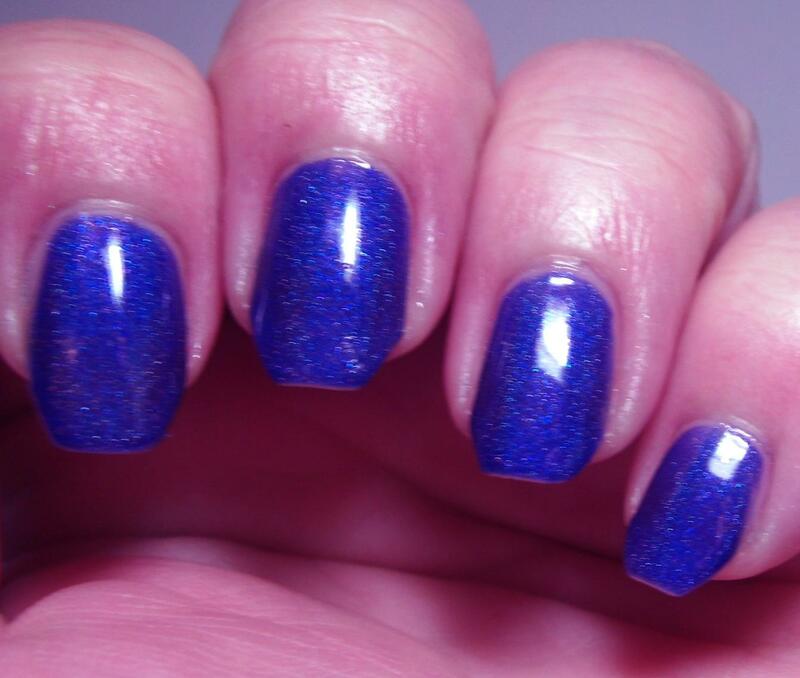 It is a sheer polish but it does build to opacity but it still retains the translucency of a jelly polish. There were no formula issues that I was able to detect. Polishes used: Barielle – Nail Rebuilding Protein; WingDust Collections – These Broken Wings; Digital Nails – Ain’t Nobody Got Time for That Topcoat. 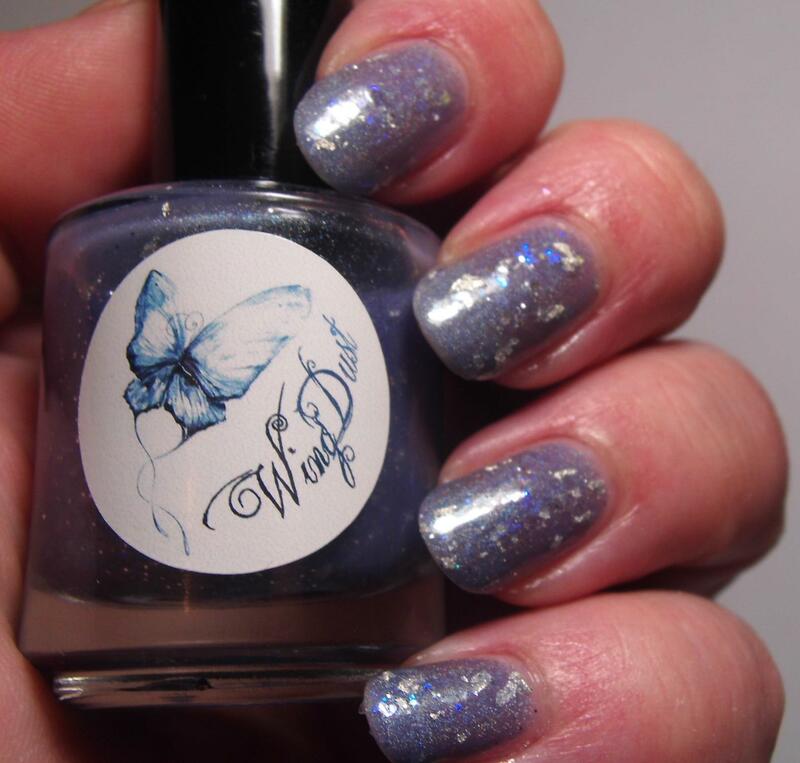 Of course you can get your own WingDust Collection polishes by visiting her Etsy Store or Llarowe. You can keep up to date on all the new collections and other fun stuff on Facebook and Instagram! Go get covered in WingDust you won’t be sorry! 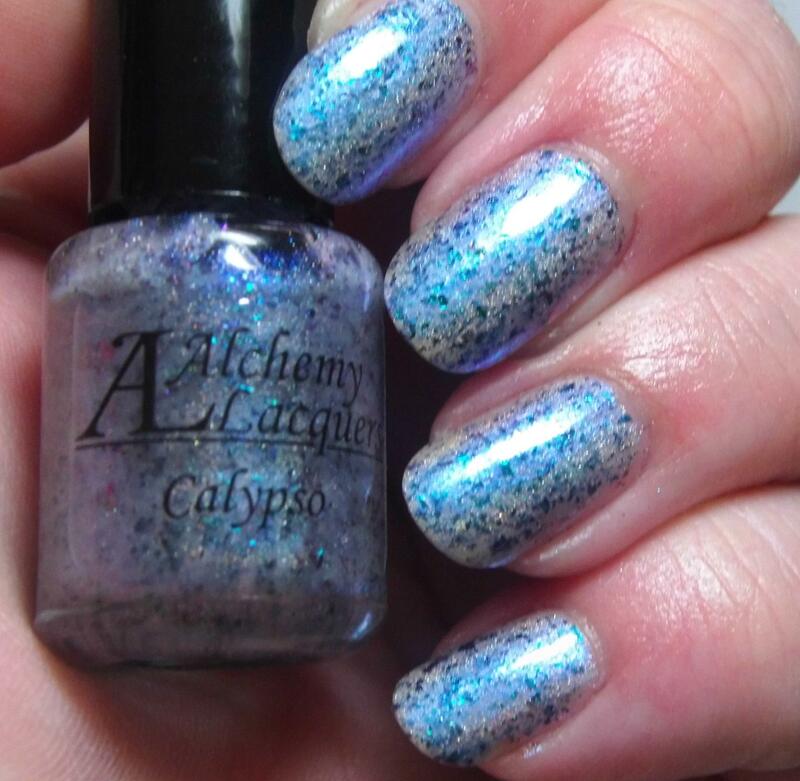 My dearest readers, I cannot wait to show you these gorgeous polishes from Alchemy Lacquers. I’m sure by now everyone is highly well-versed in the ultrachrome flakie phenomenon. I waited until I started to see something besides flakies and holo before jumping completely on the wagon because I was skeptical about longevity and what they could truly bring to the table in terms of pretty polish. 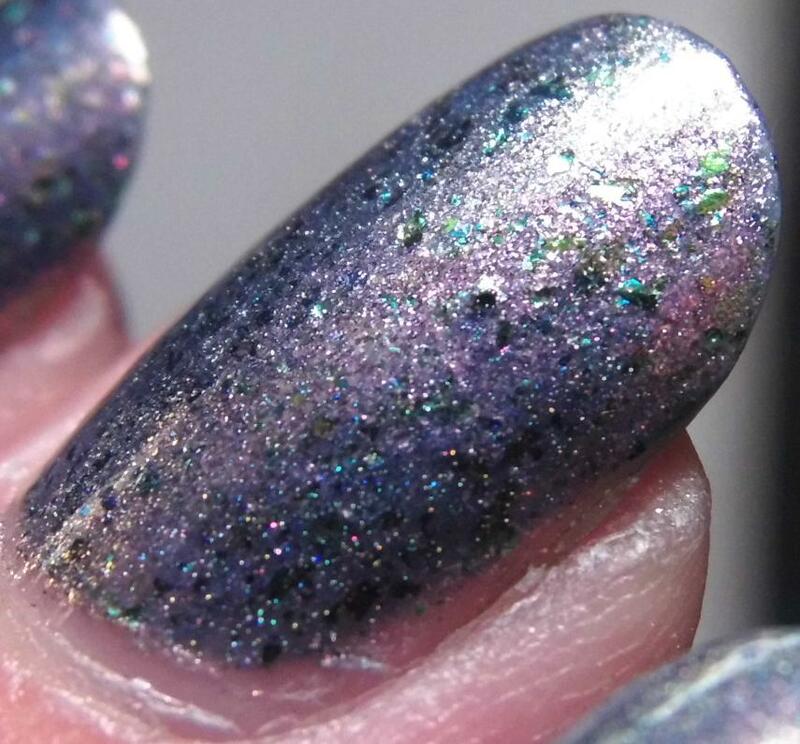 But makers quickly starting doing interesting things with the flakies and I was convinced that while the initial craze may die down, these are something that will enhance the polish game for awhile. Then Rebecca; the amazing, the wonderful, the crazy-busy, the crazy-creative, genius that she is; started working with the flakies and developing gorgeous prototypes that set us all drooling with her sneak peaks. Now the collection has a name, theme, and is ready to be unleashed upon the masses! I think I pestered her daily through her entire testing phase. The Moonshard collection is not a typical collection, it’s going to be released two at a time until they are all released and currently there are eight polishes in the collection, two of which were released at the same time as the Infinity Collection. Each of the polishes is named after a moon in our solar system. Without further ado, allow me to introduce you to the first two Moonshard polishes! 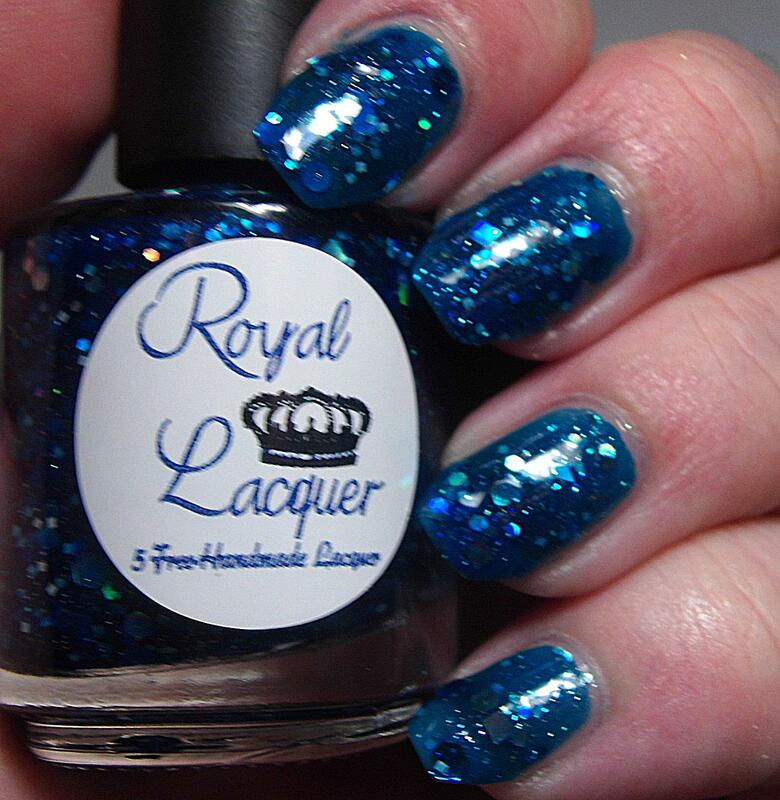 Yes yes yes…everything about this polish is phantasmagorical! 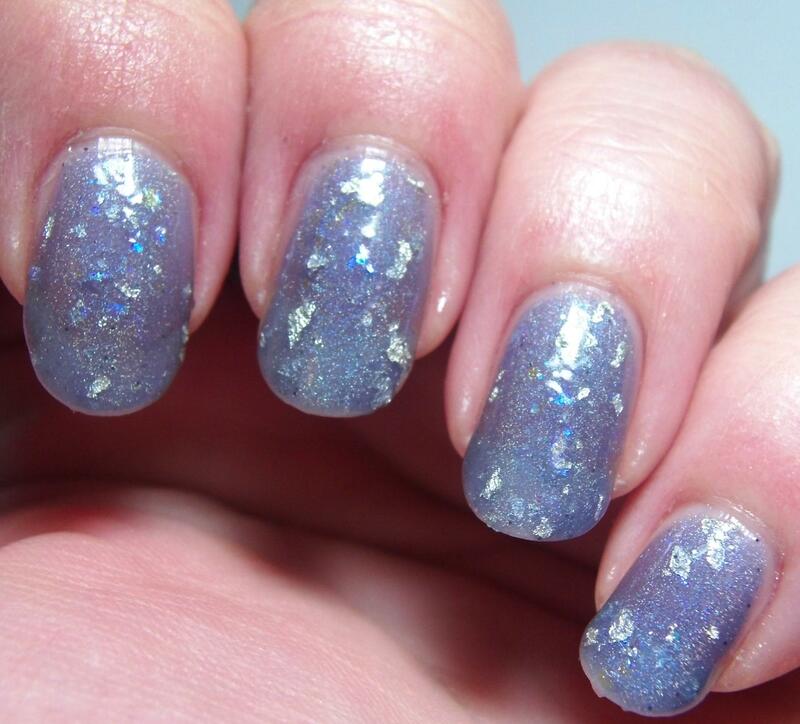 Calypso is a sheer white-ish jelly based polish with a strong shimmering shifty quality of its own. 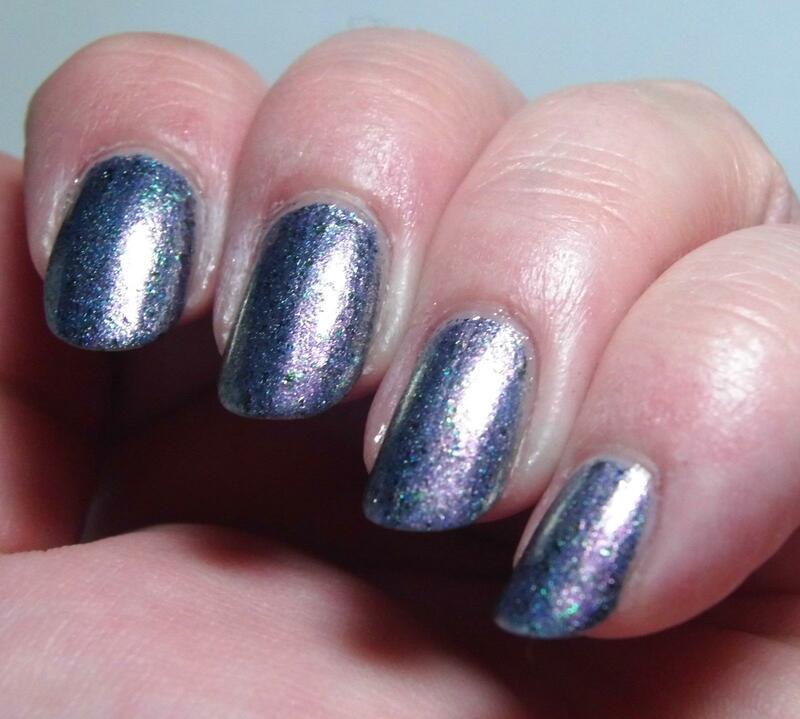 Then added to that is a healthy dose of holo and ohemgee the flakies! A whole slew of ultrachrome flakies were added to the mix. These gorgeous flakies shift from blue to purple to magenta and green. Stunning. 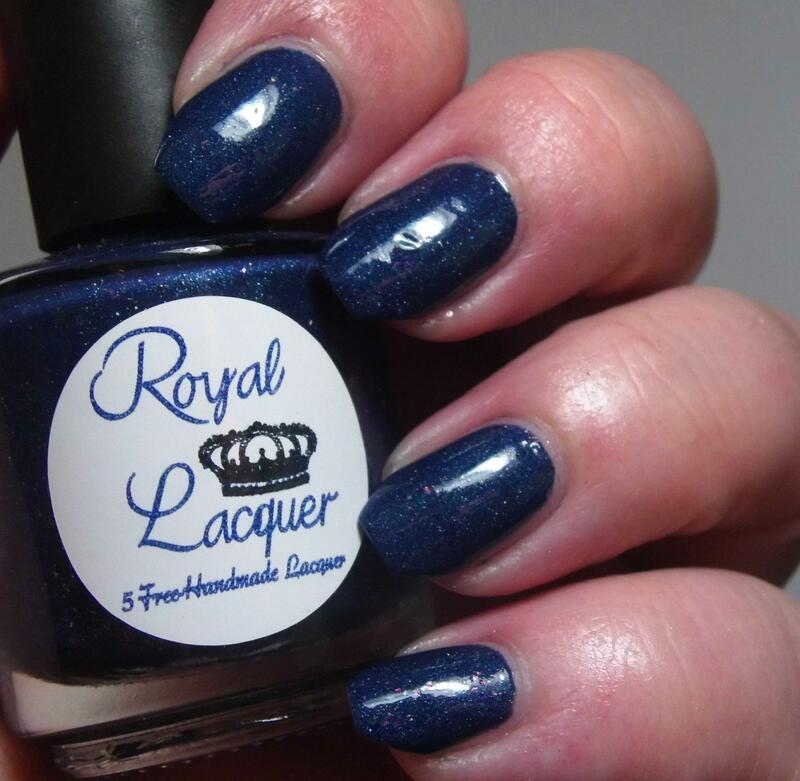 There really is hardly a way to describe this polish because there is so much going on. Suffice it to say it’s a must-have. 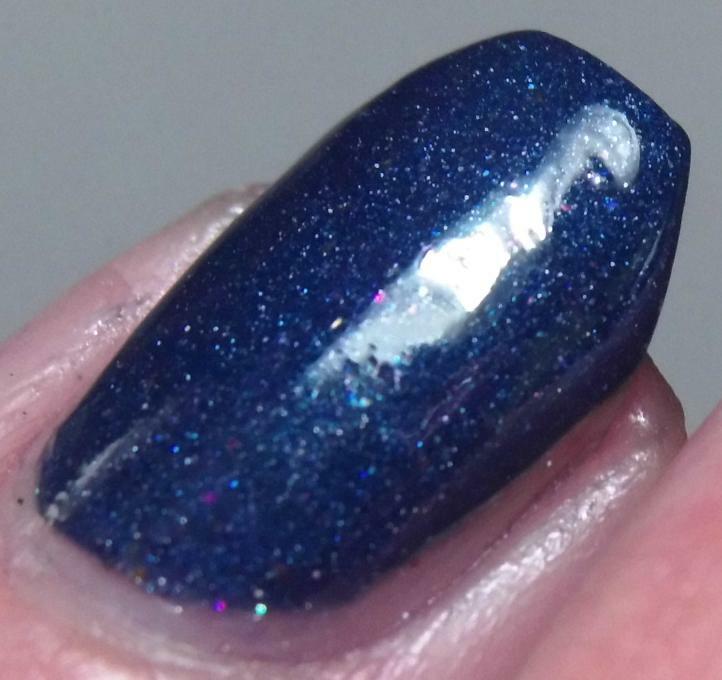 This is a sheer polish, but utterly buildable. I didn’t have any problems with the formula or application. 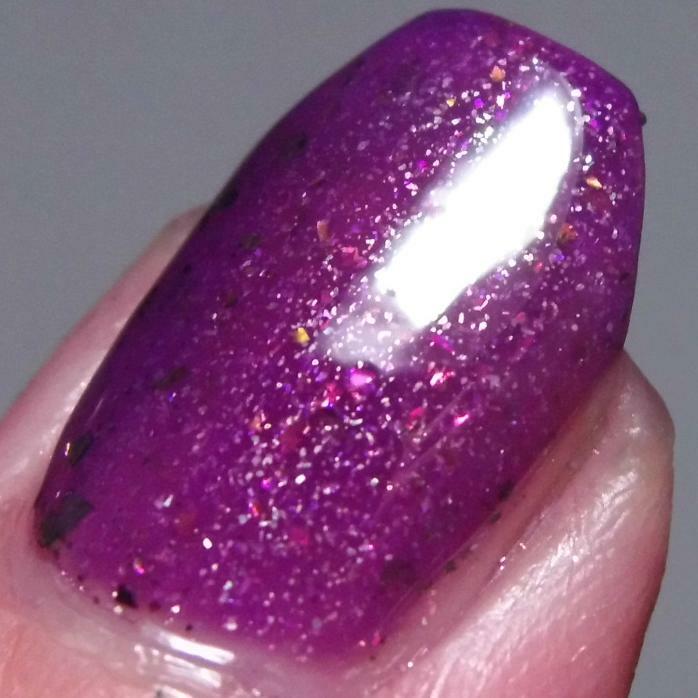 The flakies spread out evenly and laid flat on the nail. Unlike glitter there’s not a heavy texture to these so no special topcoating procedure needed to be done. Pictures show three coats plus topcoat. In my opinion that right there is the money shot. Seriously if this doesn’t send you running to snag up your own bottle of this magic I don’t know what will! Polishes Used: Barielle – Nail Rebuilding Protein; Alchemy Lacquers – Calypso; Digital Nails – Ain’t Nobody Got Time for That Topcoat. Oberon is amazing. 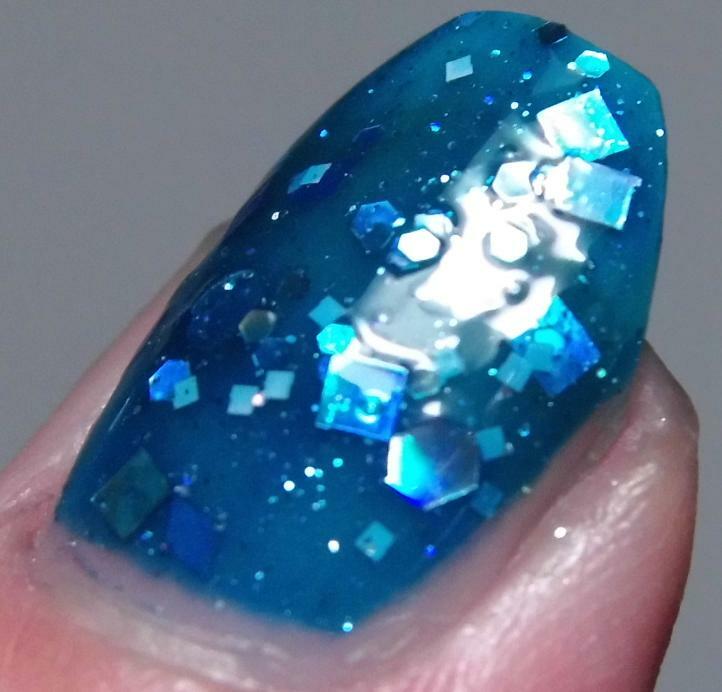 This is a metallic teal-based polish that shifts like crazy, is holographic, and oh yes has a healthy mixing of fabulous flakies. It’s no secret that I’m a glitter junkie. 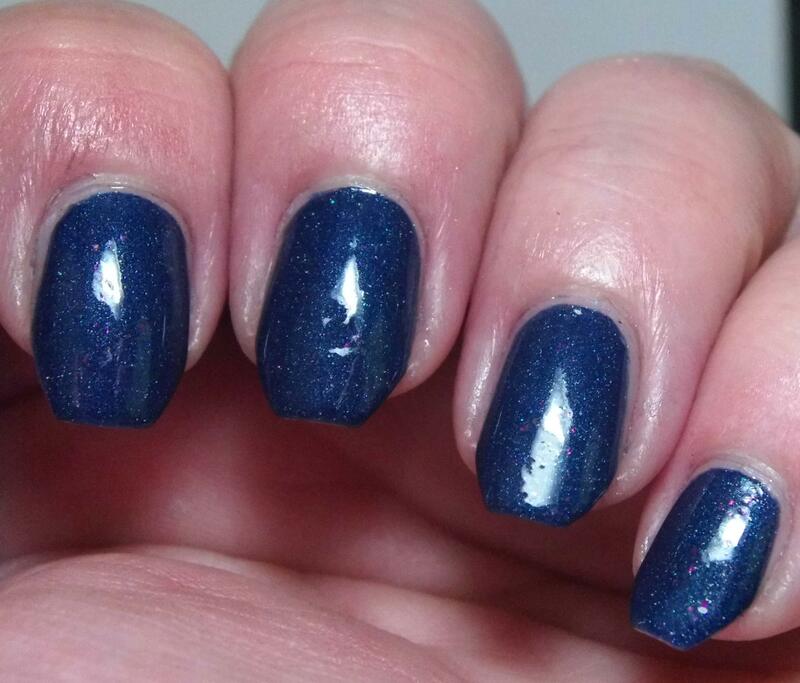 Not a lick of glitter exists in this polish and yet I am strangely addicted to how beautiful it is! This is one that I may need back ups of back ups of. Just look at that! Gorgeous. Anyway formula on this one was amazing. Perfect coverage in two coats. 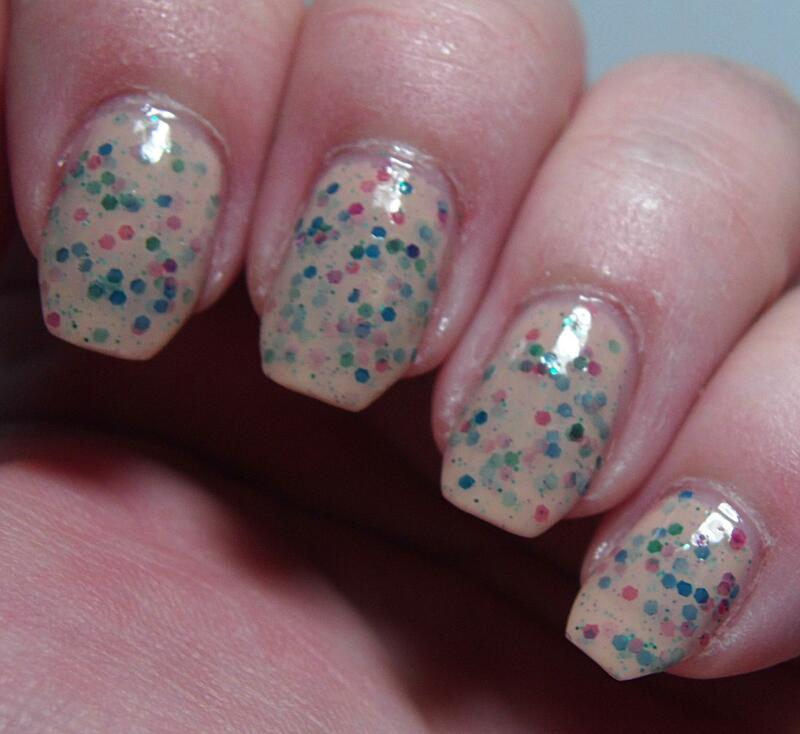 Flakies dispersed nicely throughout the polish. Sometimes polishes with a strong metallic feel like this one get a little streaky and/or show every flaw on your nail but not this one, it self-leveled like a dream and I had a perfect smooth application. Pictures show two coats plus topcoat. 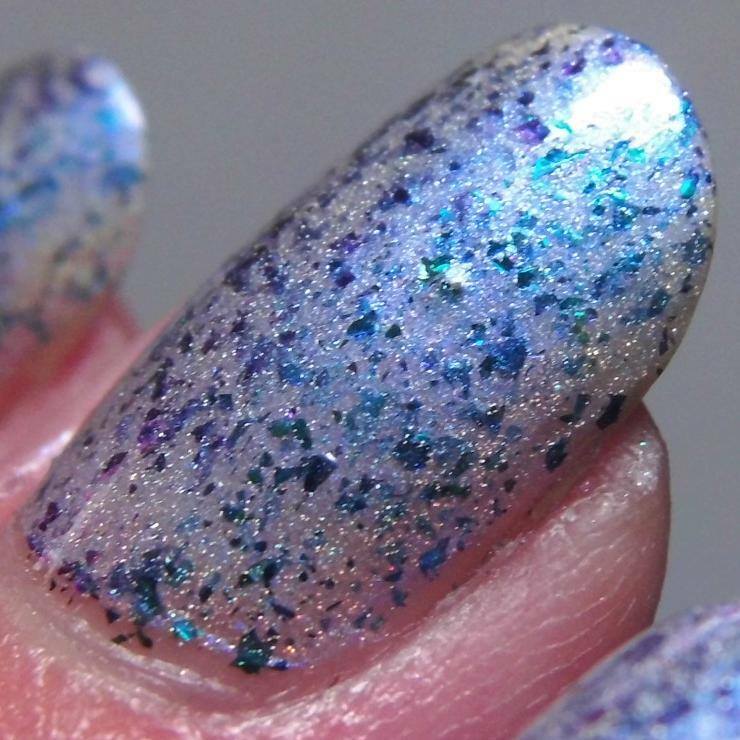 Can we just bask in the glory and amazingness of this polish for a few moments? Polishes Used: Barielle – Nail Rebuilding Protein; Alchemy Lacquers – Oberon; Digital Nails – Ain’t Nobody Got Time for That Topcoat. Well what do you think about the first two releases from the Moonshard Collection? Hit me up here or on Facebook, I promise I don’t bite…much. You should totally go and snag these up before the masses catch wind of how gorgeous they are because you know how that goes! You can find these at Alchemy Lacquers’ Etsy Shop. If you want to keep up to date on all the news and sneaky peaks of upcoming polishes you should DEFINITELY follow Alchemy Lacquers on Facebook and Instagram. Oh, and I don’t mention it much, but if you like what you read here you should totally follow me on Facebook, Instagram, and Bloglovin’. There are buttons up at the top right of your screen that will take you where you need to go! On my Instagram you’ll see swatches but also a lot of my NOTD as well!